Bladder stones in dogs (known as urinary calculi) are mineral deposits that usually begin to form because of bacteria in the dog's urine. They can be large or consist of many smaller pieces. The 2 most common warning signs of bladder stones formation are straining to urinate and blood in the urine. If your Miniature Schnauzer displays either of these warning signs during elimination or any other abnormal urination symptoms that put you on alert, seek medical attention from your veterinarian right away. Dog Bladder stones are very painful and could be life-threatening, if left untreated. So seek medical help immediately. Your dog's life could depend on it. 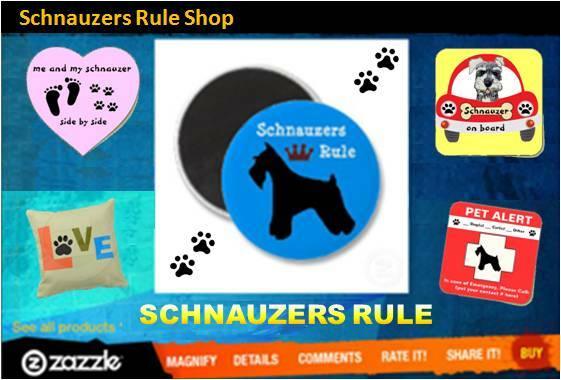 Since your Miniature Schnauzer cannot talk to you, you must be aware of your dog's habits and moods. Don't ignore any signs that are "out of the ordinary for your dog". If something seems a little off, call your veterinarian and describe your Schnauzer's symptoms for advice on what to do. 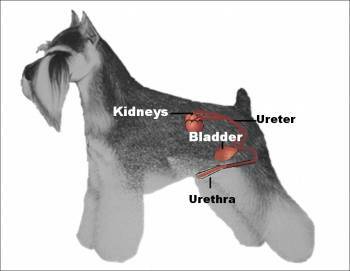 Frequent Urination: If your Schnauzer develops a need to be let out more often, this could indicate some type of internal problem or urinary tract infection. Observe and journal your dog's behavior and then call your vet for consult. Strains While Urinating: Watch your Schnauzer during elimination to see if he appears to be straining. Straining is caused from small stones trying to pass out of the bladder through the urethra. This is very painful to your dog. If obstruction occurs, the bladder will not be able to empty which poses a life-threatening condition. Blood in Urine: Look for traces of blood in your Miniature Schnauzer's urine. If there is no blood, check the color. Is the urine dark in color or cloudy? Is there a foul smell or odor? Loss of Energy: Is your Miniature Schnauzer feeling weak and less active than usual? Has your dog's eating and/or drinking patterns altered drastically? Diagnosis: Your veterinarian will examine your dog and perform a series of tests including a urinalysis, x-ray and ultrasound. The urinalysis will check for the mineral content of the urine and may contain some remnants of stones. The urine will also be tested for bacteria content. An x-ray or ultrasound will provide the veterinarian with a more precise vision of the stones. Once a proper diagnosis has been determined, treatment can begin. Treatment: Treatment will be determined based on the type of stones and problems they are causing. Treatments include: Surgical removal which is the fastest way to resolve the problem and needed when stones are large; Special diet which must be strictly adhered to for the stones to dissolve; Catheterization which is used to remove and flush out urine and stones: Anitbiotics and other medications designed to dissolve stones may be used if the stones are relatively small. Always have fresh clean water available for your Miniature Schnauzer (filtered or spring water is best). By drinking plenty of water your Miniature Schnauzer will flush out excess minerals before formation begins. Use distilled water for one full week of every month as a means of detoxification. Apple Cider Vinegar is also a powerful detoxifying agent that helps normalize acid levels in the stomach and improves the health and function of vital organs. So add a few drops to your Miniature Schnauzer's drinking water. Exercise your Miniature Schnauzer daily. Frequent walks will provide yet another outlet for your Schnauzer to eliminate more often and therefore flush out bacteria and excess minerals from the bladder. Wet vs Dry dog food. If your Miniature Schnauzer is not drinking enough water, consider switching to canned dog food which normally contain 70% water. Or be sure to add water to your dog's meal. Check pH Levels: These pH strips are ideal for testing your Schnauzer's urine at home. Ask your vet about what your Schnauzer's target level should be and then monitor it. Also ask your veterinarian about supplementing care with use of holistic herbs. Round after round of antibiotics is not the best long-term solution to preventing recurrent urinary tract problems. The key to urinary tract health, for many pets, can be found by using the right health supportive products. Only Natural Pet Cranberry Wellness Powder contains a unique set of ingredients that work together to support a healthy urinary tract in cats and dogs. 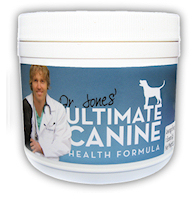 Pets prone to recurrent pathogenic urinary tract or bladder problems or struvite crystals in the urine have benefited from the addition of these key substances to their diet. helps lower urine pH (normalize pH when urine is too alkaline). helps dissolve particulate matter in the urine. helps reduce the formation of struvite crystals and stones. helps prevent bacterial attachment to the lining of the urinary tract. soothes irritated tissues in the urinary system. helps reduce the recurrence of pathogenic urinary tract and bladder problems. supports the immune system in resisting disease. Urolithiasis is the condition where stones form in the urinary system (kidney stones and bladder stones). The most common types of urinary stones in dogs are the struvite and calcium oxalate. Struvite stones are comprised of magnesium, ammonium and phosphate and account for more than one-third of all stones found in the urinary tracts of dogs. They are almost always accompanied by bacteria that create a high alkaline pH. Avoiding alkaline foods may help prevent such stones from forming. A more acidic diet would include foods like chicken, beef, eggs, fish, yogurt, cottage cheese, brown rice and beans. Calcium oxalate stones are primarily caused by high levels of calcium in the urine. The most common sign or symptom is trouble urinating. In order to prevent such stones from forming adjustments should be made in your dog's diet to maintain normal calcium levels.